Dillon Road Frontage (Approx. 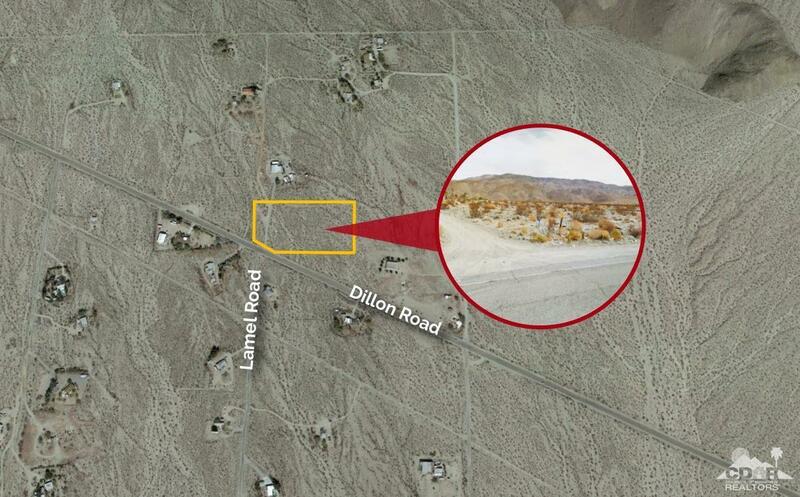 165 Feet) Southern Valley Views 30 Minutes from Coachella Fest Grounds via Dillon Road 10 Minutes from Naturally Occuring Mineral Spa Waters Present Zoning Allows Custom Home Build, Agricultural/ Farm Use, Golf Courses, Public Playgrounds and Parks. Conditional Use Permit may include but not limited to Mobile Home Parks and Churches. INCREDIBLE UPSIDE POTENTIAL for Zoning Change or C.U.P. (Conditional Use Permit) for Light Industrial or Commercial uses. Please contact Riverside County for specific processes. * *Buyer to verify size, square footage, zoning and use. Listing provided courtesy of Shawna Beamer of Berkshire Hathaway Homeservices California Properties.